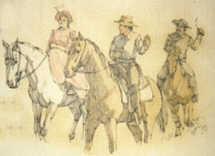 The emigrants made their way from the Snake River to the Malheur River across what Sarah Sutton, in 1854, described as “the most dusty dry and hot bare desert that any person ever travers’d…” Vale was the point at which they crossed the Malheur river, watered livestock, camped and washed their clothing; many emigrants took advantage of river water heated by nearby hot springs. Short cut Ends in Disaster! Weary emigrants were only too receptive to any idea that might shorten their journey, especially if it meant avoiding the Blue Mountains. Stephen Meek, pilot of an 1845 emigration, persuaded 200 families camped near this site to follow him on an alternate route across the desert to the upper Willamette Valley. 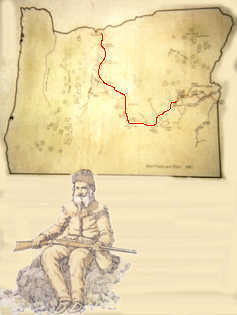 The expedition became stalled at Lost Hollow. Unable to find water to the west, the emigrants turned north and twenty-four died before they reached The Dalles. The Oregon Trail was not a journey to be taken lightly; hardship was the common fare. Boys will be boys however; practical jokes and monkeyshines were not uncommon. “We were soon joined by a band of youngsters from another camp, all on horseback. They bantered me to join them, but I pleaded I was on foot and could not join them, a young fellow knowing my timidity and awkwardness told me to take his horse, I accepted and started with them. I soon found myself along side of a fine, jovial young lady, as we rode slowly along, soon found ourselves far ahead of the wagons, but behind our own company, suddenly a hoodlum came galloping up behind us, and as he passed the young lady’s horse struck him with a whip. Her horse jumped, broke the saddle girth, and a young lady saddle and all were lying in the dust and sand near knee deep, but as she was laughing I knew she was not seriously hurt. The Malheur River provided much needed water for both Oregon Trail emigrants and their livestock. Nearby hot springs must have provided many an emigrant family with the first hot bath in months of dry and dusty travel. The City of Vale stands today on the same site at which the emigrants camped, and was literally born and raised on the Oregon Trail. 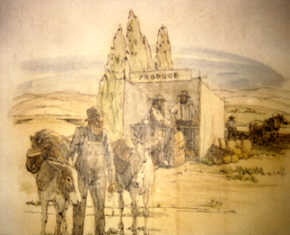 The hot springs were the site of Vale’s first structure, described by Sarah Sutton, emigrant of 1854 as “a hut and tent occupi’d by a Mr. Turner of Oregon a Trader.” These springs were also the site of Vale’s first legitimate building; the Bulley Ranch, owned by Capt. Jonathan Keeney, a trapper, ferry-man and jack-of-all-trades, who sold whisky to Oregon Trail emigrants. Lewis B. Rhinehart bought the Bulley Ranch and built the historic Stone House, which was opened as a hotel with a grand ball on New Year’s Day 1873. 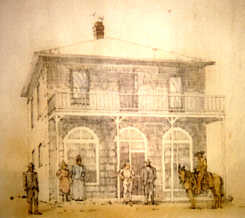 The Stone House, which still stands on Main Street, served as a stagecoach stop, safehouse, post office and store. The name Vale was originally bestowed upon the local post office in 1893. Stephen Meek, pilot of an ill-fated 1845 emigration, successfully persuaded 200 families to attempt a shortcut around the Blue Mountains. Although the endeavor proved disastrous, legend holds that in their desperate search for water the lost emigrants discovered a small amount of gold! 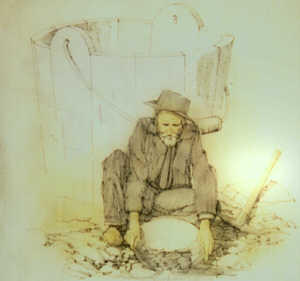 The search for the Blue Bucket gold led to other discoveries, and prospectors soon descended upon the countryside with their gold pans and pack mules. Although many deposits of precious metals have been found in the region, and mining lured many settlers back to the banks of the Malheur River, the Blue Bucket gold has eluded all seekers.